Kevin McLaughlin is an ICT Coordinator / Primary Teacher at Old Mill Primary School, Broughton Astley, Leics, UK who transformed his classroom to a personalized learning environment. 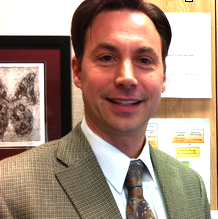 He is a Google Certified Teacher, an Apple Distinguished Educator, and Google Apps Certified Trainer. His students create PJs or what he calls their Personal Journeys. Kathleen McClaskey and I had to interview Kevin so he can share with our readers the why and how he changed his teaching and how his students learn now. Read more about this on my website. The classroom layout allows my class the freedom to explore their learning in a way that would not be possible if they were grouped by ability and had specified seating arranged for them. You can watch a video about this here. Do you believe that your classroom model can be scaled? Any educator would find it very straightforward to arrange their own classroom according to my layout. It’s a simple matter of stepping back as the teacher at the front and giving your class over to learning. How does your school determine how students learn best? I am quite fortunate in that my school respect and trust the staff to teach in the way they see best for their class. My headteacher has been very positive in my use of this approach and after 8 weeks has seen the proof through improved results in Maths and English. How do your students understand how they learn best? My class and I discussed this approach on the first day back in January. We talked about when they considered the best ways to learn, how they liked to move around to discuss learning with others in the class, how when they were at home they could take a break when they needed one, how they could sit on the floor as well as at their desk. I valued their responses to help develop our classroom layout and the personalized learning approach that they would use. What types of technologies are you and your students using to support their learning? In my class the learners have access to desktop computers, laptops, 5 iPad devices and the school PC suite whenever it has open spaces. My class can use these technologies in their learning when they know it will be an effective tool for their learning. This approach to choosing the right tool for the job is an essential skill that takes time to instill. This is a recent example of a PJ, a Personal Journey that every learner in my class receives at the start of each week. The Numeracy and Literacy targets include those required by the school curriculum but the rest is created by the learner and what they deem important to their own learning. Personalising the curriculum for every child in my class has been an inspiring journey for me. I have watched in awe at children working their way through their learning, solving problems in pairs, discussing and thinking, coming up with solutions, offering suggestions and advice to their peers. It has confirmed my belief that if we give learners opportunities to follow a personalised approach they will fly. After the very first week of using PJ’s in my class I found the following outcomes. What have you learned and what changes have you made from your initial steps? I quickly learned that using a personalised learning approach meant standing back more as a teacher and giving the learners more opportunities to develop their learning. I found that I had to stop myself from merely giving the process at the start to provoking a question that would inspire the learners to discover solutions for themselves. My planning had to adapt very quickly and I found a daily planner created by Doug Belshaw to be the catalyst for the development of our ‘Personal Journey’ that every child is now using weekly for their learning experiences. The ‘PJ’ has changed from its initial conception after discussions with the learners about what worked and what could be left out. We have now agreed on a format that every learner is happy with. What would you change in the future? At the moment I am happy with how the use of the PJ is going. Our PJ’s are on paper as we have found this is the best media for quickly changing plans on the go. I recently came across your chart on ‘Personalization vs Differentiation vs Individualization’ and it has sharpened my thinking and I will no doubt refer to it during the next few weeks to develop my approach further. 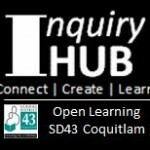 Dave Truss is an educator (Vice Principal) with the Learning Innovations Network, Coquitlam Open Learning (COL), School District #43 in BC, Canada. Dave shared his thoughts and writes about Inquiry in a way that makes it easy to understand. Kathleen McClaskey and I asked Dave some questions about the Inquiry Hub and personalized learning. He shares how his school will fit well with the BCedplan and the future of education in their Province. It fits well with Coquitlam’s School District’s collaborative work on “Learning Without Boundaries”. Q. What is The Inquiry Hub? Can you tell us how and why it was developed? The Inquiry Hub was inspired by conversations around our district vision of “Learning Without Boundaries”. 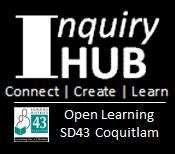 Coquitlam District Principal Stephen Whiffin envisioned the Inquiry Hub as a natural extension of our program. Stephen is Principal, and I am Vice Principal, of Coquitlam Open Learning, which offers online and blended courses for high school students, as well as to adults looking to graduate or upgrade courses. As part of the student population of Coquitlam Open Learning, Stephen noticed that we were getting more and more school-aged students that were moving away from their day schools and choosing to take full online course loads. However, this wasn’t necessarily an ideal situation, but rather a choice not to attend a local high school.. The Inquiry Hub was born out of the idea that there are students who don’t necessarily ‘fit’ in a traditional high school, but would benefit from having a school to go to daily, rather than just choosing to take courses online. Q. Can you explain the student-driven inquiry approach to learning? We are working on the simple premise that if we help students develop meaningful and engaging questions around their own interests, passions and ideas that matter to them, then the learning will be rich and meaningful to our entire learning community. By helping students connect, create and learn together, we will encourage them to look outside of their box and seek a world of potential. Q. How do you help students understand how they learn best? Thinking about thinking (metacognition) will be something all students explore at the Inquiry Hub. We are currently developing two ‘requisite’ courses that we’ll have every student take when they join us, regardless of the grade they come to us. One of these courses will be “Principles of Inquiry” which will look at domains of inquiry, question development and research design. The other course will be “Applications of Digital Learning” which will explore social networking (and creating a positive digital footprint), learning management systems, search & research, and principles of digital presentation. We will be working with expert educators in these fields to develop these courses over the coming months. Also, we won’t be having traditional styled classes but instead we will have workshops on specific topics and a significant part of the day that will be designed by students in collaboration with teachers and other students. We will have two larger learning commons areas and also smaller conference rooms that groups of students can work in. Students are empowered to work with other students, meet with their teachers or use their time working independently. We will work with students to figure out a balance of freedom in their schedule with effective use of time, with more freedom provided for students that are self-directed and more guidance for students that work best with that kind of support. Q. How do you design learning paths for each student? How do students pursue their own interests and have a voice in the direction of their learning? In the spring we will be working with teachers to examine the key learning outcomes in the BC curriculum and determine which ones can be incorporated into student driven inquiry and which ones we will support through workshops and online resources. Our goal is to maximize how much of the required curriculum can be covered and uncovered through student inquiry. As students develop and answer their own inquiry questions, teachers will consult and advise students as to how they can incorporate curricular outcomes into their projects. We also want to provide students with a voice that extends beyond the school, and we are looking for creative ways to involve parent and community groups/members in extending inquiry questions beyond the scope of the school. We hope to foster relationships such that the Hub is just a launch pad for projects that involve doing things in the community that matter and make a difference. Q. What technology will students access and use to demonstrate evidence of learning? Every student will be expected to bring their own laptop, (which we can supply if there are financial issues), and students are also welcome to bring any other devices they wish to use to connect and network as well as share what they are doing online. We are currently looking at different kinds of digital portfolios and learning management systems that would best work within our school district and also serve as an online learning hub for all of our students and staff. We are going to follow up with Dave with a podcast asking him about Truly Questioning Everything. Thanks Dave for sharing your thoughts and helping us define why we need to question everything. How can classrooms become places of intellectual stimulation where learning is viewed not as test scores but in the development of individuals who can think, plan, create, question, and engage independently as learners? Making Thinking Visible: How to Promote Engagement, Understanding, and Independence for All Learners offers educators research-based solutions for creating just such cultures of thinking. This innovative book unravels the mysteries of thinking and its connection to understanding and engagement. It then takes readers inside diverse learning environments to show how thinking can be made visible at any grade level and across all subject areas through the use of effective questioning, listening, documentation, and facilitative structures called thinking routines. These routines, designed by researchers at Project Zero at Harvard, scaffold and support one’s thinking. By applying these processes, thinking becomes visible as learners’ ideas are expressed, discussed, and reflected upon. Watch a video from co-author Ron Richard about the Importance of Thinking.